On May 24th 2018, Debbie and I will have been married for 37 years. During that period of time we have had three beautiful children, Morgan, Jessica, and Michael. Morgan is married to Eric and we have two wonderful grandchildren. Jessica is married to Ken now and we have a brand new grandgirl. Michael is dating someone very serously, and it shouldn't be long before they get married. Over the years our kids have been very involved in sports and dance, so when we were not working we seemed to be at a ball field, gymnasium, or doing bus duty somewhere. We would not change that for anything, for it has been some of the most enjoyable times of our life to this point. Back in 1982 I started Triangle Carpet Cleaners, mainly because two friends of mine talked me into it. I began to study, trying to learn the business as best as I could, and to this day I am learning something new everyday. I have always enjoyed the business, because of the immediately gratification you get when you finish your work. One of the best things about my work is the people I get to meet, and talk with. To start my business, I began by canvassing door to door trying to develop business. I do not think the temperature in that January got over 40 degrees during the day. Walking around from door to door in neighborhoods was not my favorite thing to do, but when you have a family to feed, and other responsibilities, you do what you have to do. At one time I bought a used golf cart and trailer to use in canvassing door to door, so I wouldn't have to be on my feet so much. Customers use to call and ask if I was the golf cart guy. I was doing all the cleaning at that time, and I still clean to this day. I personally do all our specialty rug cleaning, and some of our residential and commercial cleaning. Debbie, at this time, was working at the infirmary at UNC Student Health Services, as a Family Nurse Practitioner (FNP), something she has always loved to do. In March of 1987 after our son Michael was born, she was able to retire, because our business had built up enough to allow her to do that. 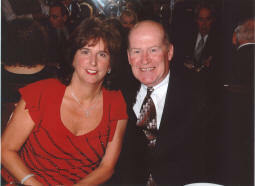 Debbie joined me in the business at that time, but most importantly she raised our kids. She was able to participate in all of our kids school, and other activities. She added the greatest asset to our business, herself, for customers love to talk to her. She manages the calendar, and office for us, and does a great job. I think she needs a raise. Debbie still fills in at the UNC Infirmary from time to time, for she still loves being a nurse. About 20 years ago, Debbie and I had to make some decisions about where we were going to go with the business. It had done so well for us, but we needed to start taking a serious look at the future of our business. We needed to take the business to another level. We went out and bought all new equipment, trucks, supplies, and became IICRC certified. With the amount of money we spent, we could have bought ourselves a new house. We needed to be able to provide the best possible service to our customers, so that we could develop the high rate of satisfaction that we have. So, what's in the future? We are just going to continue to work real hard, and provide the best customer service that we can. Personally, we will continue to enjoy our grandchildren, Donnie, Hudson, and now Natalie, trying to enjoy life. Anyway, I hope you have enjoyed our little story, and if you have any comments, please just drop me an email.